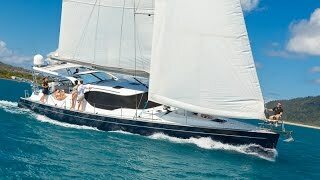 Luxury Yachts Whitsundays provide a spectacular selection of vessels with elegant and stylish features. Offering skipper yourself bareboats or crewed charter vessels, they can tailor the charter be it a day out on the water or a week-long adventure. They make it their mission to ensure your holiday is the greatest luxury Whitsunday getaway. Their 44-foot luxury Aquila power cruiser is perfect for luxury cruising. Guests will enjoy the spacious three cabin design aboard Aquila Sunrise with plenty of natural light, modern oak finishes and ample places to relax and enjoy outdoor shaded dining areas, both in the aft cockpit and flybridge. The cockpit bar provides a seamless flow between the interior and shaded aft deck, a perfect setting to enjoy champagne sundowners. The spacious saloon features an innovative raised lounge, enabling guests to enjoy views through the starboard windows while dining or relaxing. A fully equipped galley with convection stove, double stainless steel sinks, Corinthian stone bench tops which seamlessly flow to the aft deck. Entertain whilst preparing delicious meals. Nespresso Coffee lovers can bring their favourite flavours from home, the Nespresso pod machine and milk frother are an added level of luxury. 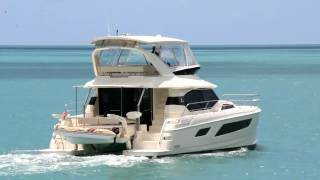 Their 44-foot luxury Aquila power cruiser is perfect for luxury cruising on your bareboat charter. Choose to skipper yourself or have a sail guide and host to look after your every need. Guests will enjoy the spacious three cabin design aboard Aquila Champagne Sunset with plenty of natural light, modern oak finishes and ample places to relax and enjoy outdoor shaded dining areas, both in the aft cockpit and flybridge. The cockpit bar provides a seamless flow between the interior and shaded aft deck, a perfect setting to enjoy champagne sundowners. The Motor Yacht Alani offers 5 star luxury crewed boat charter around the Whitsundays, including day trips to sunset cruises or live-a-board experiences. Accommodating up to 35 guests for day cruises and 9 guests for live aboard charters, we can tailor your charter however you desire. Available from Abell Point Marina in Airlie Beach, or Hamilton Island, you can cruise the smooth waters as the sun sets, champagne in hand, take you on a day cruise to Whitehaven Beach, explore the underwater world on a dive or snorkel, or stay overnight in a secluded bay. Let your crew and private chef look after your every need as you live in luxury on board MV Alani. Indulge yourself and your guests with a sunset cruise, day journey or overnight charter for any occasion. Quantum offers an exceptional experience for birthdays, weddings, anniversaries, celebrations and private getaways and what better place to cruise than the smooth waters of the warm Whitsundays. 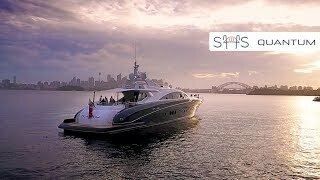 Quantum is a custom-built, 120-foot luxury superyacht and the only one of her kind in the world. With entertainment areas that can accommodate up to 45 guests for cocktails and canapés, 30 guests for a casual buffet and 18 guests for formal dining or overnight and weekly charters are also available, providing accommodation for up to eight guests in our luxurious staterooms. You could experience the breathtaking views of the sun setting from a prime location in the Whitsundays with friends, family or colleagues. They can tailor your journey to your own special requirements with premium catering selections from local suppliers sourcing locally grown produce and products. Their crew are professionally trained and provide faultless service. Whether you’re spending an afternoon or a few weeks aboard Quantum, this premier superyacht offers a once-in-a-lifetime experience. The new Hélia 44 Evolution invites you to cruise in harmony with the beauty of your surrounds in the world heritage listed Great Barrier Reef Marine Park and islands of the Whitsundays. Designed for maximum living space and boasting beautiful natural light throughout its interior, this elegant and luxuriously appointed catamaran also delivers a dynamic performance at sea. Purpose built for private luxury charters, Whitsunday Bliss has three private double ensuite cabins with numerous features to provide comfort and entertainment. Enjoy the best of the Whitsundays as your skipper will ensure an itinerary is tailor made to you, choosing the destinations you want to visit and seeing the very best the Whitsundays has to offer. Golden beaches, tropical warm water with breathtaking scenery make for an unforgettable holiday and Jalun can certainly deliver. Getaway on a true five star luxury sailing experience fully crewed for your enjoyment, relaxation or activity packed charter. Whether you are looking to unwind or go an adventure the 65-foot sailing catamaran Jalun will offer what your heart desires.